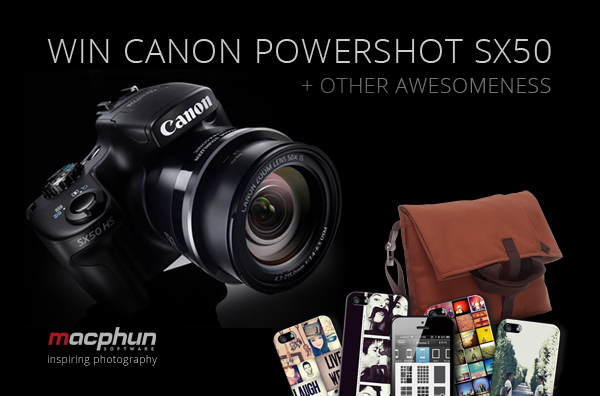 Take part in the rocking giveaway by our friends at MacPhun. You have a chance to win Canon PowerShot SX50 HS. There are also some sweet prizes for runner-ups, like Casetagrams and Bluelounge postal bags. The nicest thing about it is that there are no restrictions, except for the one – love Photography like we do. The Giveaway finishes in a couple of days. So act quickly, enter now! You’ve never heard about MacPhun? This is the team of software developers who created popular photo apps such as Snapheal, FX Photo Studio and ColorStrokes. This week you can get the apps with 15% OFF! Use this coupon code at the checkout: PHOTODOTOSPECIAL and enjoy unlimited photo creativity.